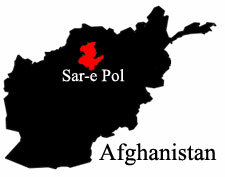 Afghan military officials say at least seven Taliban militants have been killed by an air strike that was carried out by Afghan security forces in the northern Province of Sar-e Pul. Nasratullah Jamshidi, a spokesman for the Afghan Army Corps in the northern region, says 11 other militants were wounded late on October 7 when Afghan government aircraft targeted a militant training center in the province’s Kohistanat district. Jamshidi did not specify the type of aircraft used to carry out the air strike. There was no immediate comment about the attack from the Taliban. Meanwhile, police in Afghanistan’s northern province of Baghlan say two police officers were killed by a militant attack on their checkpoint. Police spokesman Zabihullah Shuja said one other police officer was wounded by the attack in the Dand-e Ghori district, an area that has been a Taliban stronghold in northern Afghanistan for the past four years.